Paco residents staged a ‘unity walk’ to protest the impending eviction threat due to the North-South Railway Project under President Duterte’s Build, Build, Build program. The group marched from Philippine National Railway (PNR) Paco Station to nearby barangays that are expected to be carpeted to pave way for the said project. They called out to onlookers to support and join the protest appealing to suspend and review the construction of the railway project. “Sa halip na igiit ng PNR ang right of way na makakasagasa sa daang kabahayan, dapat pagtuunan nito ang rehabilitasyon ng mga bagon at mismong riles.” said Rey Navarro, spokesperson of Sta. Mesa-Pandacan-Paco People’s Alliance. Thousands of families in Sta. Mesa, Pandacan, and Paco in Manila City in 112 barangays would be displaced due to the construction of the railway project. 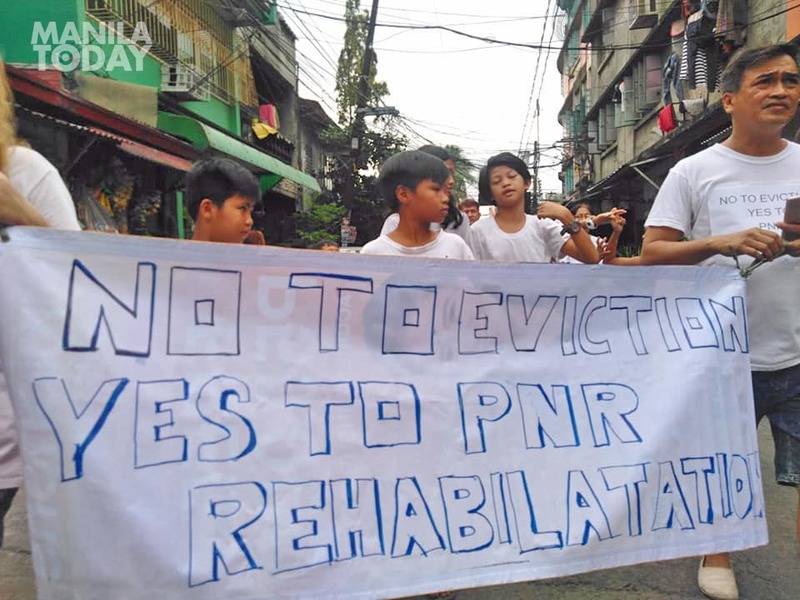 Paco residents stage unity walk against eviction. Photo by Precious Alyssa Anacta. In Paco, residents estimate that hundreds will be evicted to pave way to the construction of a PNR Central Station. Residents of these communities expressed their dismay by tying white ribbons with written demands against their impending eviction. “Hindi kami tatahimik sa harap ng napakalaking banta ng pagpapalayas sa amin sa aming mga komunidad at tahanan,” said Navarro. The group challenged the Duterte administration to stop and review the said project and consider the appeal of residents. “Dapat maging makatwiran ang pamahalaan sa lahat ng plano nito,” said Navarro. Navarro said the residents were also ready to dialogue with authorities to relay their demands and their call to stop the demolition of their homes.